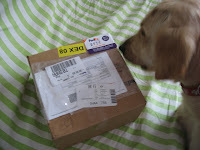 I Love Dino: FedEx delivered my Worldwide Fido prize! FedEx delivered my Worldwide Fido prize! 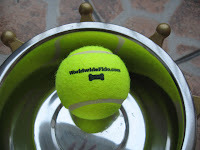 Our trusted FedEx guy delivered a parcel today, it is my long awaited prize from Worldwide Fido for winning the "Best Trick" contest for the month of August! Yay!!! It was shipped from USA on the 18th and arrived today on the 24th, so that took about one long week to reach me. Mum seemed more excited than I was. 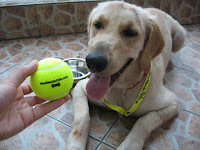 We were both delighted going through all the things in the box, there was an awesome Worldwide Fido Crown doggy bowl and a dog tag with the words "Best Trick" engraved on them, plus a WWF t-shirt, a lanyard strap, a WWF tennis ball and a gift certificate for a Free Collar. So many goodies packed into one small box, what a wonderful surprise indeed! 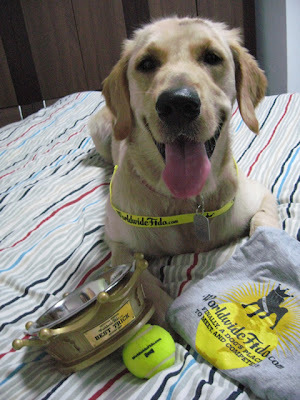 A BIG thank you to Worldwide Fido for inviting us to join the contest and to everyone who voted for me. I love my prizes and I love you all!!! Woof! Woof! Woof! Congratulations, Dino, on all your prizes. You really made out like a bandit with all the things that Mom got for you at Pet Paradise too. 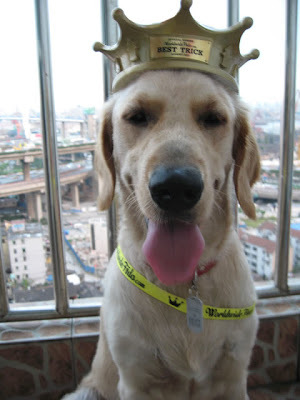 But, you know what, you deserve them all, because you are a very good dog. Maybe one day you will get to travel across the pond, like that package did. If that ever happens, I would love to meet you. Aww... you were simply fanstastic... always love watching you clips... such a smart and adorable boy!! Nasty Hot Spots! Not again! Yay!!! I won the "Best Trick" Contest!